Read the entire tale at The Daily Beast, and see a selection of Gispert’s arresting photos on his site. As we reckon with the collision of High and Low, we might wish a fashionable Happy Birthday to Coco Chanel’s greatest rival, Elsa Schiaparelli; she was born in Rome on this date in 1890. 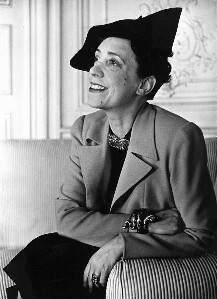 Schiaparelli, who collaborated with artists including Salvador Dali, Jean Cocteau, and Alberto Giacometti to dress socialites (like Daisy Fellowes) and celebrities (like Mae West) was frequently dismissed by Chanel as “that Italian artist who makes clothes.” While Schiaparelli is not as well remembered as Chanel, Schiaparelli made lasting contributions to fashion: she created wraparound dresses decades before Diane von Furstenberg and crumpled up rayon 50 years before Issey Miyake’s pleats and crinkles; she created the first evening-dress with a jacket and the first clothes with visible zippers. But her most fundamental contribution to couture was surely the sense of fun– of playfulness and “anything goes”– that she shared with her Dadaist and Surrealist friends.